From smartphones and drones to mirrorless and action cameras, take a look at our in-depth list of the 30 best travel cameras of 2019 – tried and tested by travel bloggers at the top of their game! Searching for a new camera? Look no further – we’ve put together a whopping compilation of the best cameras for blogging and travel in 2019! We asked some of our favourite bloggers about the cameras they use for business and pleasure. After all, outside of the professionals, bloggers are some of the most passionate photographers around – and much more relatable too! What’s the best camera for blogging AND travel? The iPhone X weighs just 6.14 ounces and has both a front and back facing camera. The back-facing camera is 12 MP and has both wide-angle f/1.8 and telephoto f/2.4 aperture. It also has an optical zoom and a digital zoom of up to 10x. Apple’s newest feature is its portrait mode which makes for studio-style portraits. Its front-facing camera is 7MP. the iPhone X has 4K video recording at 24 fps, 30 fps or 60fps and can also record in 1080p and 720p. It is splash, water and dust resistant and IP67 rated. “I love the iPhone X for its newest feature, portrait mode. With decent lighting conditions it creates an image with a shallow depth of field, mirroring what a low aperture setting on a typical professional camera. While this is limited to decently lit subjects, it is still a nice feature to have and I use it often for close ups of my kids. Another reason why I love the iPhone X is that it is always with me. As a single mom of two kids, carrying around my DSLR and a heavy lens for the day often gets heavy. It is usually replaced with snacks, water bottles and things to occupy my kids while we travel. When I travel without them, the DSLR will come back out again, but for now, the iPhone is always with me! The Samsung Galaxy S9+ is consistently ranked as one of the top 3 smartphone cameras currently available on the market. This top-of-the-line phone comes in at 6.22 x 2.91 x 0.33 in and weighs 6.67 oz. It has an 8MP front camera, a 12MP rear wide-angle camera, and a 12MP rear telephoto camera. The camera, of course, offers dual optical image stabilization, digital zoom up to 10x, and optical zoom up to 2x. One of the features that sets this camera apart from the rest is the dual-aperture on the rear-wide camera, with two separate f-stops! The built-in camera app also has a Pro mode, which makes it easier to get a quality image without a lot of post-processing. “Although I’ve only had this smartphone for a couple months now, I am absolutely thrilled with my purchase. The phone is great, and the switch from iPhone to Android was much easier than I imagined. I was looking for a smartphone that would give me the option of not bringing out my big, heavy DSLR if I didn’t want to. This more than fits the bill. I have been thoroughly impressed with the different shooting modes; the Food mode saves me a lot of post-processing work, and the Pro mode is a thing of beauty. I did a lot of research before choosing this phone, and actually went to a store to physically look at this phone, the iPhone X, and the Google Pixel 2 XL. Although an SLR camera is still better than a smartphone, particularly because you can change lenses, it’s come to the point where smartphones take such good pictures that you don’t necessarily need an SLR camera. At 145.7 x 69.7 x 7.8 mm, the Pixel 2 is still quite a large phone but it’s more manageable than a lot of the competition. It’s also lighter than the other phones weighing just 143 grams, compared to the iPhone X (174 grams) and Galaxy Note 8 (195 grams). “Recently, I decided to stop travelling with an SLR camera and to switch to just travelling with a smartphone instead. Three phones had grabbed my attention: the iPhone X, Galaxy Note 8, and the Pixel 2. After a lot of research, I settled on the Google Pixel 2. Price was a big factor in my decision. The Pixel 2 is about half the price of the iPhone X and, comparatively, great value for money. Size was another important consideration. The Galaxy Note 8 had been on my radar but, after picking it in a shop, I realized that it was much too big: it was almost too big to fit in my pocket, and pretty much impractical to take running. Price aside, the camera reviews were great and it was being touted as being as good as many of the more expensive competitors. It isn’t necessarily the hardware that makes the Pixel 2 a particularly good camera (the 12-megapixel f/1.8 unit didn’t excite many tech reviewers) but rather Google’s photo processing capabilities. The Advanced HDR+ mode in particular means the phone takes some of the best pictures of any current smartphone. The biggest downside has to be the headphone jack, which has been replaced with a USB-C port. If you want to use your headphones, they’ll either have to have Bluetooth (and you’ll have to remember to have charged them) or you’ll have to use a USB-C to 3.5mm headphone jack adapter to hand. In March 2018, Huawei released the Huawei P20 , its latest flagship phone with innovative camera technology. It is a more affordable alternative to the triple-camera P20 Pro, which was released at the time. While the P20 doesn’t have some of the P20 Pro’s luxury features like 3x optical zoom, it’s still one of the most powerful phone cameras on the market. Developed in partnership with Leica, it features dual-camera technology with a 24-megapixel front and 12/20-megapixel rear. “I love the P20 because it’s the first time I’ve felt I can take professional-quality photographs with my phone. Whether I’m shooting in full daylight or at night-time, the images it delivers are sharp and detailed. My favourite feature is the AI scene recognition. The P20 camera recognises 19 different environments, such as ‘greenery’, ‘blue sky’ and ‘food’, and applies optimal settings accordingly. The Canon PowerShot G7 X Mark II is a great camera for travelling, especially for families or those who don’t want to carry a heavy DSLR. With a wide aperture lens starting at f/1.8, this camera is great for low-light conditions or for creating depth of field pictures. The camera has a touchscreen which flips, a 20.1 megapixel 1-inch sensor, full HD 60p video recording and the ability to shoot in raw format, so it’s a great all-round camera. You can choose to shoot in a number of exposure modes or fully manual and the Wi-Fi capability is excellent for connecting to a phone to transfer pictures. It is one of Canon’s premium compact cameras so doesn’t come cheap. “Since getting this camera as an alternative to carrying my DSLR around with us while travelling, it has become my most used camera. I had been on the lookout for a good, compact camera to use around our young son as I found my DSLR too cumbersome. This was recommended to me by other fellow bloggers and I took a chance. It paid off. The Sony RX100 III features an amazing 20-megapixel sensor which allows a lot of enlargement with no drop off in detail. And, best of all, it is very small and light and absolutely quiet. For street shooting, that’s important. If you don’t want to make the substantial investment in a top-level professional system, this is a fantastic camera at a fraction of the price. The RX100 also comes in versions IV, V, and VI. The IV and V are worth consideration if you want 4K video, and the VI has a lens that zooms from the equivalent of 24 to 200 mm. Of course, those versions cost more than the III. There are also versions I and II, which don’t have the pop-up viewfinder. “A camera I’m becoming increasingly fond of is the small Sony RX100 111 “point and shoot” – although it’s much more than a point and shoot. It has a pop-up viewfinder which I find much easier to compose precisely with as well as a back screen that tilts both up and down, if you prefer. One of the best travel cameras is the Panasonic ZS series, specifically the Panasonic Lumix ZS100 (also known as the TZ100). This is a compact point and shoot camera, rather like the Swiss army knife of cameras. It’s light, pocket/hand size yet does so much like touchscreen lens, one inch sensor with 20.1 million effective pixels, , x10 optical zoom, Wi-Fi built in and 4k video capture. “We love the Panasonic ZS100 because it’s made for travellers. It takes excellent high quality pictures, yet it’s compact so can easily fit in your hand or large pocket. As such it’s not the cheapest, but well worth the money. We love the 4k feature, which continues to take photos, thus allowing you to set it on a tripod and then move into position trying out various poses, then picking the ones you want afterwards. Very handy! * The newer model is the Panasonic Lumix ZS200. The Panasonic Lumix ZS60S (also known as the TZ80) is a great camera for the size and money. It has an electronic viewfinder that auto senses so there is no requirement in changing settings, it works really well in strong sunlight. The camera has 18 million pixels with a 30x optical zoom. It provides the equivalent of 24-720mm, with a f/3.3-6.4 maximum aperture. The ZS60S has a three-inch touch-sensitive screen which helps with autofocus and working through menus. “Our criteria is that it needs to fit into a travelling pants pockets, as I like to hike with both hands-frees. It’s a great camera for the size and the money – being able to use the electronic viewfinder when its too sunny to see the digital display at the back is a superb feature. The Kodak PixPro AZ422 is described as a bridge camera, marking the boundary between point and shoot and a DSLR. Its key features include 42x optical zoom, 24mm wide angle, 16 megapixels and 3 inch LCD, plus a 720pd HD video and optical image stabilization. Weighing in at 444g for the body alone, it features a wide choice of shooting modes, although its automatic selection is reliable. Straightforward in operation and reassuringly robust, it performs well for landscapes and its zoom potential is impressive. This camera provides surprisingly stable video content with audio that minimizes wind noise well, while still picking up the sounds you want, like the waves crashing. “I like the PixPro for its reliability and its ability to take great shots without much intervention. The vid quality and sound is much better than I had imagined it would be. The zoom facility is fantastic, picking out details on racing yachts at sea and buildings on the other side of a wide estuary with ease. * The Kodak PIXPRO Astro Zoom AZ421-BK is a popular model from the same collection. An update of the Nikon D7200, the Nikon D7500 is much faster than his predecessor. If features the 20.9 megapixel APS-C sensor from the Nikon D500 and has a high sensitivity, up to ISO 51.200. It is possible to set the ISO quite high without having grain on the photos. The DSLR camera offers 8fps continuous shooting with AF/AE tracking, which enables you to quickly shoot excellent action photos. The new AF system features 51 AF points, as well as group area settings, plus Auto AF fine tune as on the D500. The camera is comfortable to hold thanks to the deep grip and improved texture on the rubber covering. Regretfully, unlike the D7200, it has just one card slot, which looks like taking a step back, but apart from that, it generally is a neat improvement on the previous model that justifies the higher price range. “Those are all numbers and details, but what it comes down to is that with my D7500, I can shoot photos that are really sharp and clear. I often use it with my favorite lenses Nikon 18-140mm f/3.5-5.6 G and Nikon 50 mm f/1.4G. It’s not a very lightweight camera, but it is definitely doable to carry it on me while travelling. One feature that I find very practical is the tilting touch-screen, which enables me to shoot from original perspectives without having to adopt a weird or uncomfortable position. The Canon Rebel is Canon’s entry-level DSLR camera. It is perfect for amateur photographers who are ready to get their feet wet in DSLR photography. As this has been one of their most popular lines, Canon has released at least one new version of this camera since the inception of the line in 2003 – the latest model is the Canon EOS REBEL T7i . On average, the cameras weigh around 18 ounces, making them lightweight and easy to travel with, and they come packaged with an 18-55mm lens, which is great for shooting mostly anything if you’re just starting out! “I’ve loved using the Canon Rebel for as long as I’ve been traveling! It’s been the perfect camera for me to discover and grow into my love of photography. Since it didn’t cost too much to start with, I feel like I have room to spend a bit more on lenses now, and when I’ll probably soon upgrade, but I might just upgrade to their newest Rebel! The Nikon D7100 is Nikon’s 2012 semi-professional DSLR camera which comes in at a price range of $600-$800 USD (body only). This model is suited for avid photographers who aren’t quite at a beginner phase of their photographic journey but still not ready to commit to a full-blown professional camera. The D7100 features 24.1 Megapixels and also offers both JPEG & RAW image file taking capabilities. Its 2 SD card slots allow for much flexibility in image file saving as well; perfect for either backing up the images in the first SD card slot or offering more file storage after the first SD card becomes full. The sensor in the Nikon D7100 is a CMOS with a focal length multiplier of 1.5x, making it a cropped sensor (as opposed to full frame). The D7100 also features video capture at Full-HD (1920×1080) at 30fps with MOV file formats. However, it doesn’t offer video stabilization. “I’ve been quite satisfied with the Nikon D7100 as it suites my needs as a semi-professional photographer. It’s also quite lightweight which makes it easy for me to take around on my cultural world travels. This subsequently allows me not to skimp on the quality of my travel photography. The images are crisp and it allows me to shoot even in low light situations without getting much grain in the images even at high ISO settings. It’s cropped sensor is also great for portrait photography (which I enjoy) as it gives a closer crop of the subject I’m capturing. However, for architectural photography, the cropped sensor works as a con as even with a wide angle lens there still remains a crop factor of 1.5x. While I am quite pleased with the quality of images that this Nikon model produces, I must say that the video feature leaves much to be desired. 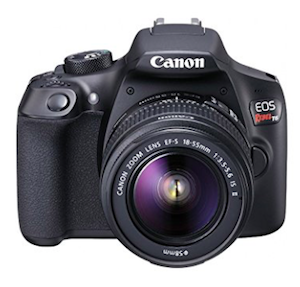 The Canon EOS Rebel T4i (also known as the 650D) is a versatile digital SLR that is ideal for travel photography. It’s a very light camera body, weighing just 525 grams. It’s essentially a ‘prosumer’ model, pitched at the camera enthusiast but shooting RAW files of over 51 MB, big enough for stock libraries and publication. It was the first Canon DSLR to have a touchscreen, and has continuous autofocus in video mode. The Rebel T4i was superseded soon afterwards by the Rebel T5i, which is very similar; the only real differences are the external coating and previews of creative filters in Live View. “I bought the Rebel T4i as a stopgap in 2013, and five years on I still use it. Overall, I’ve been very pleased with the results, and have shot a lot of amazing material with it. It was always my intention to upgrade within twelve months or so, but I haven’t done so yet. I tend to use the body in conjunction with a Tamron 10-24 mm wide angle and Canon 28-135 mm telephoto, and found that the quality of these lenses has been superior to the 18-55 mm lens that came with the camera. The Nikon D5300 is the perfect camera for photographers looking for a solid DSLR having outgrown entry-level DSLRs. It comes with built-in Wi-Fi, GPS, and 24.2-megapixels. You can enjoy remarkably clear images, enhanced movie recording and be able to send images directly from the D5300 to a smartphone or tablet for easy sharing. The D5300 Nikon camera allows you to Geotag your images with precise location information. The Wi-Fi function also connects the camera directly to a smart device, so you can share photos right after you’ve taken them. You can also record smooth, finely detailed Full HD video clips. For easy access you can also quickly capture perfect shots using a range of scene modes, including Sports, Beach, and Snow by Simply selecting the mode that matches the subject or situation you’re shooting, and the camera will automatically optimise shutter speed, ISO, and aperture for superior results. You can also have full control and manually focus and shoot images to your liking. “I love Nikon products, and this is my second DSLR having upgraded from the 3100. This is perfect as I can shoot images and within seconds download them to my phone if I need to share them on Instagram or Facebook. It’s a nice solid camera that allows me to shoot high resolution images as I tend to shoot RAW on manual for maximum image detail and quality. The Nikon D3300 is a fantastic, easy to use camera that is perfect for traveling. This lightweight DSLR allows to take great landscape and portrait photos, especially if matched with the right lense. It captures even the smallest details with incredible definition and great resolution. During an African safari, set it on A for incredibly detailed photos of wildlife. The Canon EOS Rebel T6 (also known as the 1300D) is the perfect travel camera for those that want a lightweight, affordable camera that can capture high-quality photos of their travels that they will cherish. At around $350 you can get this camera with a versatile kit lens of 18-55mm which is perfect for the range of environments you come across when travelling. Not only does this camera come cheap it also shoots an impressive 18 m.p and in both .Jpeg and .RAW format making editing a breeze. The lightweight nature of the camera means it’s easy to carry around both in a backpack and strapped around your neck. It also comes with a ton of bonus features like WIFI connectivity making it really easy to pair with the Canon Connect camera App. So if you’re out and about and get a brilliant shot, you can transfer it to your phone in seconds and upload to share instantly! The Sony a7R III is definitely one of the best high-end mirrorless in the market at the moment. When paired with the Sony 24-70 f2.8 lens, it makes for a wonderful travel set up, ideal for landscape, street, food, and portrait photography.The camera is simply unbeatable when shooting in low light, since it reaches up to 102,400 ISO! The camera also has excellent battery life, even in cold weather, can go full silent (which is great when shooting in churches/temples or during ceremonies), it’s incredibly fast at 10 frames per second, and has razor-sharp autofocus. The only cons are that the camera is very, very expensive – about $3000 for body only, with most high-end lenses starting at about $2000. “I’m completely in love with my Sony Alpha 7rIII. I was a bit uncertain about switching from a DSLR to a mirrorless, especially given that the camera+lens setup cost me over $6000, but it’s really money well spent! The Sony a7R II is a full frame beauty and coupled with a 35mm Zeiss lens (the camera comes only with the body), all your travel shooting needs are pretty much met. It is definitely way lighter than a DSLR, it has amazing autofocus at par with a DSLR and fits nicely in a purse! A very high ISO and low f-stop of 2.8 ensure nighttime photography to be a breeze too! “I purchased the a7R II Mirrorless camera (top of the line in A7 series in 2017 before the arrival of the A7R III) and have not touched my heavy DSLR since then! I have carried it all over the world and am totally in love with its functionality, the razor sharpness of the Zeiss lens and the quality of photos that I shoot. 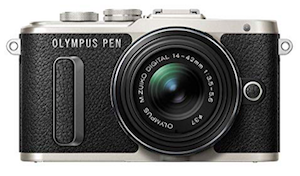 The Olympus OM-D E-M5 has a retro & stylish look, especially with the silver and black combination. The weight is just perfect for long street photography sessions and it has a lovely range of lenses covering every range you can think of. The image quality is up at the top of the spectrum giving cameras much more expensive a run for their money. “Though we also use our Nikon 5300 regularly, the Olympus has a lot going for it which makes it a personal favourite. Add to it the advantage of a 5 axis image stabilization and it is almost impossible to get a blurred image even intentionally making it ideal for shaky hands, slower shutter speeds and night photography. The Fujifilm X-E3 is a 24-megapixel mirrorless camera featuring 4k video capabilities and a pretty compact size. The camera has Bluetooth and wi-fi connectivity, and an AF joystick for those who don’t feel comfortable using its highly sensitive touchscreen with gesture control. XE3 focuses very fast and produces brilliant, sharp images with warm and realistic color tones. “I like Fujifilm X-E3 because is very small and light to lug around (approximately 340g including battery and memory card) and the buttons are highly customizable and clear and simple. In other words, I can get snapping easily exactly as I want. You can turn a wheel set next to the lens on the front to change ISO, a wheel next to your thumb for shutter speed and the lens has an aperture ring. Canon scored a big upgrade to their stable of mirrorless cameras with the release of the Canon EOS M6 . The quick-shooting, fast-autofocus M6 weighs in at only 343g. But don’t be put off by the size – the EOS M6 packs plenty of features into its small frame. The multi-angle touchscreen lets you take good shots from any angle, which combined with HD video recording makes it an ideal choice for vlogging. To top it off the 24MP camera has built-in WiFi which is perfect for setting up remote shots. “At first, I was hesitant about buying the EOS M6 over a DSLR but luckily my partner Corina talked me into it. We needed to purchase a new camera before our honeymoon and it was a perfect fit. The image quality was much better than we expected and we have taken it through a dozen countries in the past year. The Olympus PEN E-PL8 is a mirrorless 16-megapixel camera with a very stylish look. Because of its look and features, it has been marketed as the ultimate “bloggers” camera, and with a price of $599.00 it is not silly expensive but affordable for most bloggers or/and amateur photographers. The camera has a vintage look to it and is quite heavy, but that only adds to the “quality-vibe” that this camera is sending out. The Olympus Pen E-PL8 has numerous art and vintage filters, a dedicated selfie mode and 3-axis sensor-shift image stabilization that will help keep photos and video steady. There is also a custom self-timer which lets you take multiple shots with a specific gap in between shots. Time-lapse has been added, which lets you combine the shots into a video. FullHD video is recorded with stereo sound, and when using a power zoom lens you can choose the zoom speed. The camera is handy, has built-in Wi-Fi, a touch-screen on the back and comes in black/silver, white/silver, and brown/silver. “As someone who enjoys taking pictures but hates complicated cameras, I can honestly say that I really like my beautiful Olympus Pen E-PL8. I sometimes dabble with shutter-timer, ISO and other stuff to get the perfect shot, but mostly I just select a scene mode and push the button. The Sony Alpha a5000 is a perfect entry into the mirrorless world for a beginner photographer. At less than $600 the camera is insane value for the money spent. It is more than capable of taking excellent pictures as it features the same 20MP sensor as the more expensive A6000. It can be used as a powerful point and shoot replacement and as you grow with it you can purchase better, sharper lenses. It is small, pocketable, and has all the features a beginner photographer needs. For connectivity it has WiFi and NFC to transfer photos quickly and easily to your phone or computer. * A newer model is the Sony Alpha a6500 . The Garmin VIRB 360 is a 360 camera which means it records (or photographs) everything all around it. It’s an action camera, works under water, and it’s small and light enough to be carried around easily. It has a stitch on both sides (where the 2 photos are connected to make one 360 image) but it’s small and discreet. “I love our VIRB. It takes great photos, under and over water, and the movies are exceptional. It does take a little while to get used to it and to do the editing, but I think it’s very worth it! It’s a mid-range action camera and it needs constant use of a tripod. The Garmin VIRB Ultra 30 is an action camera that’s a direct competitor to the possibly more market dominant, GoPro Hero6 Black. As you’d expect it’s small at just 58x46x31mm. It’s also light at 89 grams. The camera comes with bucket fulls of action cam features including 4k resolution, video image stabilization, photo burst mode, voice control and a colour touchscreen display (that still works when it’s inside the hard-shell waterproof case). There’s even YouTube live streaming! One particularly strong feature of the Garmin VIRB is that it has many and varied data overlay options. Even without any sensors supported, you can add a huge number of data types to your videos, including Speed, Pace, Altitude, G-Force, Orientation, Hang Time, Jump Height, Jump Distance, Rotations in Air, Jump Count, Distance, Grade, Relative Elevation – there are more if that’s not enough for you! These kind of data overlay options can really bring your videos to life. “I love my Garmin VIRB Ultra 30, it’s my go-to action camera. I also own a GoPro Hero5 Session, but I find the Garmin takes better footage, particularly when it’s cloudy or overcast. One handy feature of the Garmin VIRB is that it has a dedicated photo button. Measuring 6.2 x 3.3 x 4.4 cm and an ultralight weight of 117 grams, the GoPro HERO6 can be easily stored in your pocket or hanged with a necklace while you stroll around if you have the proper accessories. Moreover, it can be used as a point and shoot camera with the help of its touchscreen LCD display or connect to a smartphone for larger and more controlled preview. Use an appropriate mounting adapter and connect it to a selfie stick or any regular tripod. “I’m a heavy DSLR user but there are certain things such as underwater clips and stills only a dedicated action camera can capture. However, this latest addition to the GoPro family offers a lot more feature than just being an action camera. On my part, I wanted a more portable camera that would help me capture multiple time-lapse photos without the need for an intervalometer or similar accessories. I got myself a GoPro Hero 6 Black mainly for this purpose. The GoPro Hero5 made a splash when it launched in early 2017. It made the choice of buying the latest GoPro easier because it didn’t come with many variants except for a Hero5 Session. On the plus side, the waterproof action cam was a delight to use for someone like me who often goes underwater on beach destinations. The best part was that it wasn’t overpriced compared to its predecessor. Even though the latest version launched some time ago, the Hero 5 still has the best specs with value for money. It’s waterproof to 33 feet, shoots proper HD videos, has an easy-to-use touchscreen LCD and is hassle-free overall. What else do you need really? Unless you really want the Hero6, the Hero 5 has enough features to pack a punch as of today. “I’d been lusting over a GoPro for a while before purchasing the Hero 5. I took it with me to record my adventures on my two-month trip across Portugal and Spain. Handling the camera was easy given its touchscreen LCD. To shoot between photo and video, I also got a Remote that worked brilliantly with my voice control. I’d recommend getting a Remote as well as a compatible stick to shoot without destabilising your videos. With so many GoPro accessories, it is difficult to know which products you need and what brand to buy – find out the 23 best GoPro travel accessories in 2019! The DJI Mavic Pro revolutionized drone photography for frequent travelers. Now you no longer have to compromise quality and portability. The Mavic Pro folds up to the size of a large water bottle, yet is packed with the all features you’d find on larger drones: a 4K stabilized camera, front obstacle avoidance sensors, a shockingly durable design, and a 27 minute flight time. The just-released DJI Mavic Pro 2 upgrades these features even further for those looking for a more premium purchase. The DJI Mavic Air is an incredible compact foldable drone that was launched in 2018. The drone is extremely travel friendly in terms of its size and weight. The drone can be used both indoors and outdoors. The package is quite neat as you will get a compact bag with compartments to carry it in which includes a space for the drone, the remote control and batteries. The DJI Mavic air costs in the range of £770. “It is a powerful and compact drone easy to set up and use whilst on the go. The price is reasonable for the features it comes with, although it is in the mid price range. Some of the cons of the drone are you need buy an extra battery if you plan to do a lot of droning and photography when out and about and you will need to get a memory card for it. The DJI Spark is one of DJI’s smallest and more budget friendly drones. At a weight of 300g, a size of 143x143x55mm and an average cost of $399 it’s a great beginner option for travellers. Pictures are captured at 12mp and it has decent video quality including automatic modes, where it can track an object ‘hands free’ or even spiral up and around a subject. “As someone that travels a lot with only a carry on, I find it’s small enough to fit in a regular sized backpack with the rest of my luggage. I love the way I can fly it just using a mobile device, it has a shorter range than the controller at a 50m height and 100m distance but I find this is enough for the majority of shots I want to capture (controller range = 1.2 miles). The Canon PowerShot G7 X Mark II is a compact camera for underwater photography. Whilst it isn’t waterproof in its own right when combined with the canon underwater housing (WP-DC55 ) it is the perfect camera for underwater photography down to 40metres. It has a range of setting and can shoot in full manual mode and RAW. It records 20MP and has a wide aperture of f1.8, making it perfect for low light and indoor photographs as well as underwater. Whilst this isn’t a budget camera, the images and video are really good. Out of the housing the camera is pocket sized and is useful as a day to day camera. “I love using this camera underwater as it gives me full control of what I am doing. Underwater the light can be difficult but the f1.8 means I am not limited by this. The macro function works really well for small critters and having RAW means that I can take pictures and sort out the colours afterwards. This is really important as the water makes everything appear blue. The Nikon Coolpix W300 is a versatile and easy to use point-and-shoot camera perfect for scuba divers. It’s waterproof to 30m/100 ft without a case, so it keeps its pocket-size and light weight (111.5mm x 66.0mm x 29.0mm; 231g), and is a budget solution for deep diving. It has a 16-megapixel sensor, a 5x optical zoom and captures videos up to 4K-resolution. However, advanced photographers will regret the limited manual mode and the absence of RAW file format. “I think the Nikon Coolpix W300 is the best underwater camera for scuba divers. I love how I can easily take beautiful underwater photos without worrying about my photography equipment when I’m not using it. The Advanced PADI certification allows to dive up to 30m deep so I can take my camera for all my dives. The Instax Mini 9 is probably one of the most affordable Polaroids you can get. However, the films are not cheap, they cost about $1.5 a pop while the outcome of the shot is very hard to predict. It also takes up space in your luggage. The results can be unpredictable but overall the Instax is very unique and delivers super cute photos! “It was back in 2015, I was undecided on where to stay in Mui Ne when a guy in the hostel in Ho Chi Minh City took a photo of someone else on his Polaroid Instax Mini8. He told me a bit about it and I got really excited – when I got to Mui Ne, I bought one right away. I don’t own a powerful camera, just my action camera and my phone but I love my Instax Mini 8. Congratulations! You’ve made it to the very end of our list! Did you enjoy reading our guide to the Best Cameras for Blogging and Travel in 2019? !